The National Environmental Policy Act (NEPA) of 1969 requires federal agencies, including the Fish and Wildlife Service (FWS), to consider the potential environmental impacts of their proposed actions and any reasonable alternatives before undertaking a major federal action, as defined by 40 CFR 1508.18. For FWS, NEPA compliance is triggered by a discretionary federal action that is subject to FWS control and responsibility (40 CFR 1508.18). The nature of the action could either be the construction of a project, granting a permit, providing federal funding, or any other action where a federal decision is required. In the context of hydropower development, if the FWS grants a right-of-way (ROW) for a transmission line outside the FERC project boundary, the FWS would be the lead agency for purposes of completing the relevant NEPA documentation. The Council on Environmental Quality (CEQ) has established general regulations governing all NEPA actions, which can be found at 40 CFR 1500 - 1518. In addition, 40 CFR 1507.3 requires federal agencies to establish procedures that implement the CEQ regulations. The United States Department of Interior (DOI) NEPA procedures can be found at 43 CFR 46, et seq. DOI’s NEPA procedures apply to its constituent services such as the FWS. While DOI’s NEPA guidance can be found in Department of Interior, Department Manual 516 Chapters 1-6, FWS’s NEPA guidance can be found in the FWS NEPA Handbook. A CX may be granted for categories of actions that individually or cumulatively, do not have a significant effect on the environment. Federal agencies may establish CXs in accordance with their NEPA procedures. If extraordinary circumstances are present, an EA or EIS may be necessary, even though the activity would otherwise be covered by a CX. See 40 CFR 1508.4. An EA is a concise public document that helps the agency to determine whether an EIS or Finding of No Significant Impact (FONSI) is required. It should include a brief assessment of the proposed action and an analysis of the evidence relating to significant environmental impacts. It should also include an analysis of the effects of the proposed action and of the alternatives. See 40 CFR 1508.9. If the FWS determines that there are no significant environmental impacts after completing the EA, it will prepare a FONSI. A FONSI is a document prepared by a federal agency that briefly explains why an action will not have a significant effect on the human environment. See 40 CFR 1508.13. During the EA process, analysis of environmental impacts may result in a finding that the proposed federal action may cause significant effects to the environment that cannot be mitigated. The FWS official then decides whether NEPA requires the FWS to prepare an EIS. An EIS should describe the purpose and need for the proposed action, and discuss all of the all environmental impacts of the proposed federal action, alternatives to the proposed action, and mitigation measures. See 40 CFR 1502.12 and 40 CFR 1502.3. NEPA compliance is triggered by discretionary federal actions subject to FWS control and responsibility (40 CFR 1508.18). The nature of the action could either be the construction of a project, granting a permit, providing federal funding, or any other action where a federal decision is required. For example, a FWS grant of a ROW for a transmission line outside the FERC project boundary is subject to environmental review under NEPA. 9-FD-l.2 to 9-FD-l.5 – Does a Categorical Exclusion Apply? A CX may be granted for categories of actions that individually or cumulatively, do not have a significant effect on the environment. Prior to completing the NEPA process, the FWS will review the project to determine whether the project fits within the category of actions covered by an existing CX (516 DM 8.5). The FWS’s CXs are listed in 516 DM 8.5. The FWS will apply a CX if the scope of the project is consistent with the terms of an applicable CX and there are no extraordinary circumstances. If the FWS applies a CX, the FWS will issue a Decision Memo and not complete the full NEPA process. If extraordinary circumstances are present, an EA or EIS may be required even though the activity would otherwise be covered by a CX (see 40 CFR 1508.4). Extraordinary circumstances are factors or circumstances in which a normally excluded action may have a significant environmental effect that then requires further analysis in an EA or EIS (see 43 CFR 46.215). To determine whether extraordinary circumstances are present as set forth in 43 CFR 46.215, the FWS will complete a Categorical Exclusion Checklist. The FWS’s checklist will incorporate the list of extraordinary circumstances found at 43 CFR 46.215. For example, if an approval fits within the category of projects for which a CX is available, the CX will not be applied if the approved action will, “Have significant impacts on such natural resources and unique geographic characteristics as…wild or scenic rivers;…sole or principal drinking water aquifers; prime farmlands; wetlands; floodplains;…and other ecologically significant or critical areas (43 CFR 46.215(a)). If the answer to all questions on the checklist is “no”, the FWS will apply the CX and no further NEPA documentation is necessary (for detailed discussion, see page 12 to 13 of the FWS NEPA Handbook). If the answer to any question on the checklist is “uncertain” or “yes”, the FWS will not apply the CX and will complete the NEPA process. Where the FWS applies a CX, a Decision Memo is prepared for signature and approval by the authorized FWS officer for proposed activities. Decision Memos must identify the decision to be implemented and the reasons for categorically excluding the proposed action. Specifically, the Decision Memo must state the category of the proposed action, the rationale for using the categorical exclusion, and a finding that no extraordinary circumstances exist. Finally, the Decision Memo must indicate a date of implementation, whether the decision is subject to review or appeal, and the applicable regulations. Certain projects under review for a ROW might qualify for categorical exclusion from the NEPA process under 516 DM 8.5(C)(4) for “the issuance or reissuance of permits for limited additional use of an existing right-of-way for underground or above ground power, telephone, or pipelines, where no new structures (i.e., facilities) or major improvement to those facilities are required; and for permitting a new right-of-way, where no or negligible environmental disturbances are anticipated.” Although it is unlikely for this CX to be used when permitting a new ROW for a transmission line, it is possible that this CX would be used when granting new permission for use of an existing transmission line ROW. The FWS will begin the formal NEPA process by forming an interdisciplinary team to conduct the NEPA review. The FWS project manager will review the proposal and then select the resource specialists for the interdisciplinary team (ID Team) for preparation of the NEPA document. The ID Team may be directly involved in the analysis and writing of specific sections or may work with a consultant that is preparing the document (40 CFR 1502.6). If an on-site evaluation has not yet been completed, it is conducted to evaluate the potential impacts from the activity. An on-site evaluation may not be required for activities covered under casual use or categorical exclusion (CE). 40 CFR 1508.4. Scoping begins the first stage of the planning process and closely involves the public with identifying issues, providing resources and other information, and developing planning criteria to guide preparation of the NEPA document. During scoping, the FWS solicits input on the issues and impacts that will be addressed in a NEPA document as well as the degree to which those issues and impacts will be analyzed. Scoping focuses the analysis on significant issues and reasonable alternatives, to eliminate extraneous discussion, and to reduce the length of the EIS. The scoping process is ongoing throughout the early stages of the NEPA process. See 43 CFR 46.235. The CEQ Regulations explicitly address the role of scoping in preparation of an EIS and require scoping for preparation of an EIS. However, scoping is optional when preparing an EA. The FWS can choose to use the scoping process when preparing an EA that deals with uncertainty or controversy regarding potential conflicts over the use of resources or the environmental effects of the proposed action. For example, for an EA the FWS may use scoping to identify and eliminate from detailed study the issues that are not significant or that have been covered by prior environmental review. The scoping process provides a transparent way to identify significant environmental issues and to de-emphasize insignificant issues. See 40 CFR 1501.7. Scoping must be conducted both internally with appropriate agency staff, and externally with interested and affected public, agencies, tribes, and organizations (40 CFR 1501.7). Formal public scoping begins following publication of an NOI in the Federal Register. However, informal internal and external scoping may occur before the formal scoping period begins. Internal scoping is simply the use of FWS and cooperating agency staff to help determine what needs to be analyzed in a NEPA document. External scoping involves notification and opportunities for feedback from other agencies, organizations, tribes, local governments, and the public. While formal scoping prior to completing an EA is optional, formal scoping prior to completing an EIS is required. See 40 CFR 1501.7. Invite participation from affected Federal, state, local, and tribal organizations and interested persons. Determine the scope or extent of the EIS and the significant issues to be analyzed. Scoping is valuable in identifying connected, cumulative, and similar actions. Eliminate those issues raised that are not related to potentially significant impacts or those that have been covered in other environmental documents. Make assignments for preparation of the EIS between the lead and cooperating agencies. Identify any environmental documents being prepared that have relevance to, but are not part of, the scope of the EIS. Identify other environmental review and consultation requirements. Discuss the relationship between the timing of the preparation of the EIS and the FWS’s tentative planning and decision-making schedule. 9-FD-l.9 – Is the Proposed Activity Likely to Have a Significant Effect on the Quality of the Human Environment? During scoping, the FWS determines the issues to be addressed in either the EA or EIS and identifies any significant issues related to the proposed action that will be considered in the analysis. 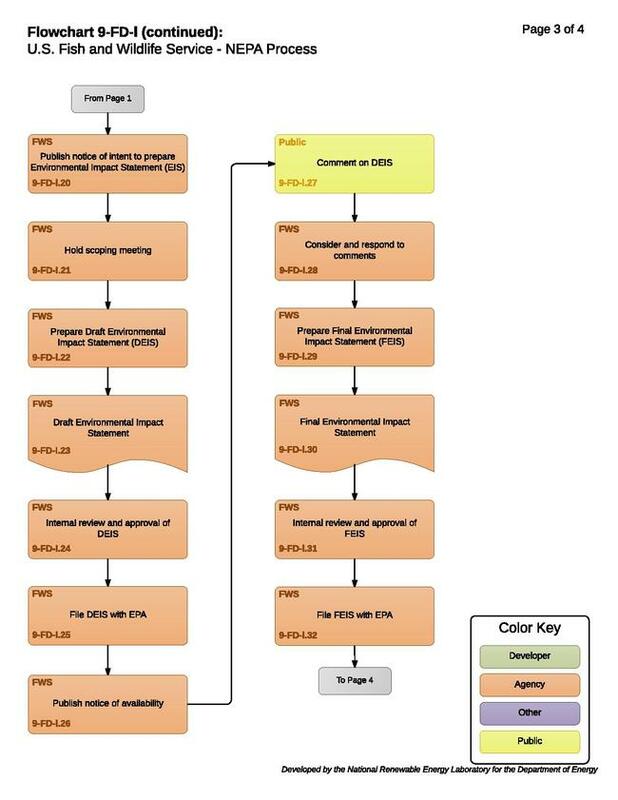 If the FWS determines the proposed activity is likely to have a significant effect on the quality of the human environment it will not complete the EA process but instead will complete the more detailed EIS process. (a) Context. This means that the significance of an action must be analyzed in several contexts such as society as a whole (human, national), the affected region, the affected interests, and the locality. Significance varies with the setting of the proposed action. For instance, for a site-specific action, significance would usually depend upon the effects in the locale rather than in the world as a whole. Both short-term and long-term effects are relevant. (b) Intensity. This refers to the severity of effect. Responsible officials must bear in mind that more than one agency may make decisions about partial aspects of a major action. Under 43 CFR 46.305 the FWS is required, to the extent practicable, to provide for public notification and involvement during EA preparation. Although there must be some form of public involvement, the FWS has discretion as to the amount and type of public involvement. Examples of public involvement include external scoping, public notification before or during preparation of an EA, public meetings, or public review and comment of the completed EA and unsigned FONSI. 9-FD-l.11 – Was the EA completed upfront? The developer may prepare an EA or may pay a contractor to prepare an EA (third-party contracting). However, the FWS is ultimately responsible for the scope and content of the EA, and will independently evaluate the information submitted and its accuracy, along with the environmental issues. The CEQ provides guidance for contracting EAs and EISs at 40 CFR 1506.5(b) and (c). The CEQ regulations state that an EA must contain brief discussions of the need for the proposal, the alternatives considered, the environmental impacts of the proposed action and alternatives, and a listing of agencies and persons consulted (40 CFR 1508.9(b)). Note that proposals are limited to federal actions (40 CFR 1508.23). NEPA review is not required for entirely non-federal actions. However, if there are impacts on FWS managed resources, it may be useful to develop and suggest alternatives or mitigation for those non-federal actions. The EA must identify the known and predicted impacts that are related to the issues (40 CFR 1500.4(c) and (g); 40 CFR 1500.5(d); 40 CFR 1502.16). An issue differs from an effect; an issue describes an environmental problem or relation between a resource and an action, while impacts analysis predicts the degree to which the resource would be affected upon implementation of an action. Impacts can be ecological (such as the impacts on natural resources and on the components, structures, and functioning of affected ecosystems), aesthetic, historic, cultural, economic, social, or health. Impacts may also include those resulting from actions that may have both beneficial and detrimental impacts, even if on balance the agency believes that the impacts will be beneficial (40 CFR 1508.8). The EA should analyze relevant short-term and long-term impacts and disclose both beneficial and detrimental impacts in the NEPA analysis. 9-FD-l.12 to 9-FD-l.16 – Is a Draft EA Required? When the FWS determines that a public review and comment period is appropriate or to meet NEPA requirements under certain limited circumstances per 40 CFR 1501.4(e)(2), the FWS must prepare a draft EA. Otherwise, a draft EA is not required, and the FWS can go from analyzing to preparing a proposed EA. If the FWS prepares a draft EA, it must offer a minimum 30-day public comment period, a period that cannot be extended. The FWS must resolve these comments before issuing a decision record. An EA is a concise public document that helps the agency to determine whether an EIS or FONSI is required. It should include a brief assessment of the proposed action and an analysis of the evidence relating to significant environmental impacts. It should also include an analysis of the effects of the proposed action and of the alternatives (see 40 CFR 1508.9). If the FWS determines that there are no significant environmental impacts after completing the EA, it will prepare a FONSI. A FONSI is a document prepared by a federal agency that briefly explains why an action will not have a significant effect on the human environment (see 40 CFR 1508.13). During the EA process, analysis of environmental impacts may result in a finding that the proposed federal action may cause significant effects to the environment that cannot be mitigated. The FWS official then decides whether NEPA requires the FWS to prepare an EIS. At the conclusion of the EA process, the FWS issues a final Environmental Assessment. An EA is typically shorter than an EIS, with fewer opportunities for public comment or involvement, and has fewer procedural requirements, generally requiring less time to prepare than an EIS. CEQ suggests that an EA should be between 10 – 15 pages. See CEQ - Forty Most Asked Questions Concerning CEQ's NEPA Regulations. 9-FD-l.18 to 9-FD-l.19 – Does the FWS Identify a Significant Environmental Impact? If during the EA process, the FWS determines the proposed activity will have significant environmental impacts, then an EIS must be prepared. If the proposed activity is not likely to cause significant environmental impacts, then the FWS will prepare a Finding of No Significant Impact (FONSI). A FONSI must succinctly state the reasons for deciding that the action will have no significant environmental effects (40 CFR 1508.13). The FONSI only needs to provide a basis for the conclusion that the selected alternative(s) will not have a significant effect. Alternatives that are not selected but may have significant effects do not trigger the preparation of an EIS nor do they have to be described in the FONSI. The EA must be attached to the FONSI or be incorporated by reference into the FONSI (40 CFR 1508.13). The FONSI must note any other relevant environmental documents related to the findings, and must be signed and dated by the decision-maker (40 CFR 1501.7 (a)(5) and 40 CFR 1508.13). An EA may demonstrate that a proposed action would have effects that are significant but could be reduced or avoided through mitigation. In these instances a mitigated FONSI may be used rather than an EIS if the FWS is able to reasonably conclude, based on the EA analysis, that the mitigation measures would be effective in reducing effects to non-significance. The FONSI must clearly identify whether the mitigation measures are needed to reduce effects to non-significance. The mitigation measures chosen must be included in the decision documentation and must provide monitoring to ensure the implementation of these measures. See FWS NEPA Handbook, at 13. If a FONSI cannot be signed because there is a significant impact, then an EIS must be prepared. If an EIS is necessary, the FWS will publish a Notice of Intent (NOI) to prepare an EIS in the Federal Register. 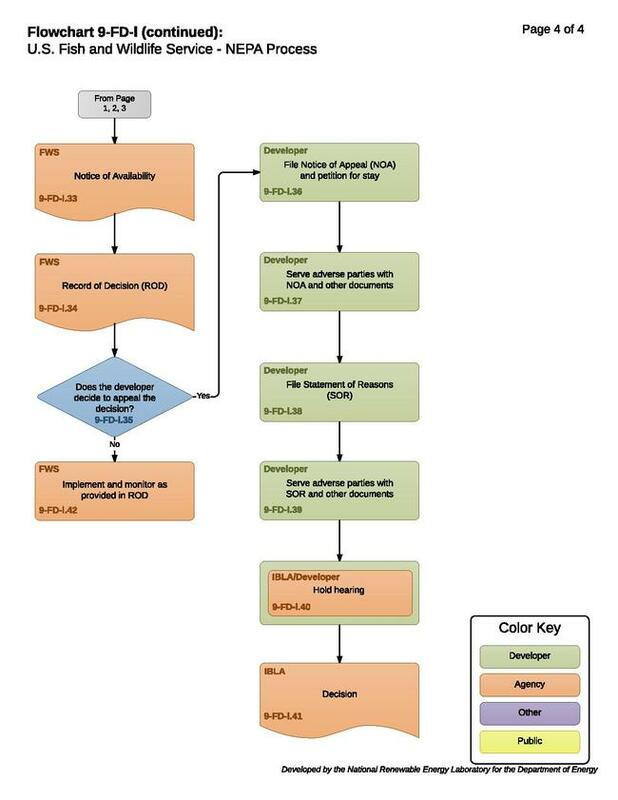 The information assembled and analyzed for preparation of the EA may be integrated into the EIS and used for scoping for the EIS (40 CFR 1501.4(e)(2)). If during the EA process, the FWS identifies the proposed activity will have significant environmental impacts, then an EIS must be prepared (40 CFR 1502.4). The EIS process is initiated with publication of a notice of intent (NOI) and requires formal scoping (40 CFR 1501.7). (c) State the name and address of a person within the agency who can answer questions about the proposed action and the environmental impact statement. For planning documents, also identify preliminary planning issues and planning criteria. When preparing an EIS, the FWS will hold a scoping meeting to involve the public in identifying issues, providing resources and other information, and developing planning criteria to guide preparation of the NEPA document. 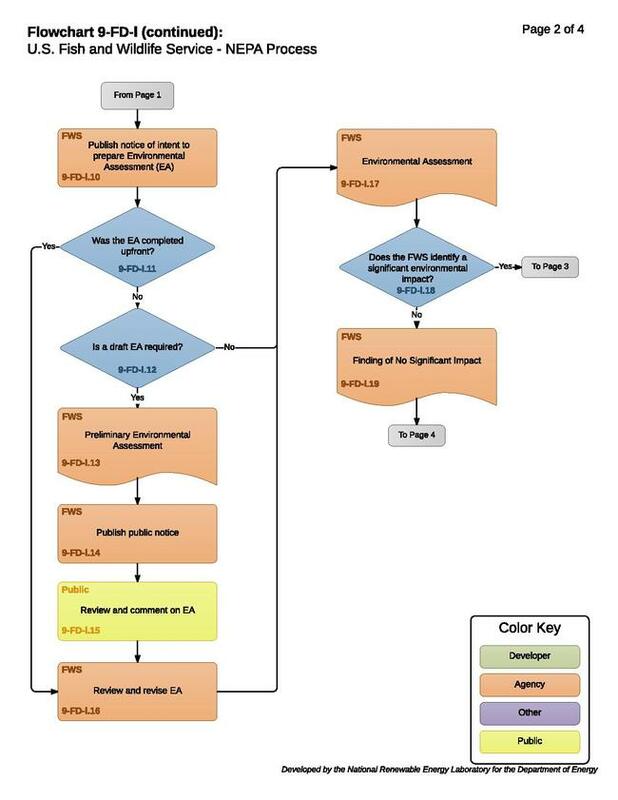 If the FWS previously conducted scoping for development of an EA, material from the previously conducted scoping analysis may be incorporated into the scoping analysis for the EIS. "Scope" consists of the range of actions, alternatives, and impacts to be considered in an environmental impact statement. The scope of an individual statement may depend on its relationships to other statements (40 CFR 1502.20, 40 CFR 1508.28). To determine the scope of environmental impact statements, agencies must consider three types of actions, three types of alternatives, and three types of impacts. (2) Cumulative actions, which when viewed with other proposed actions have cumulatively significant impacts and should therefore be discussed in the same impact statement. (3) Similar actions, which when viewed with other reasonably foreseeable or proposed agency actions, have similarities that provide a basis for evaluating their environmental consequences together, such as common timing or geography. The FWS may wish to analyze these actions in the same impact statement. The FWS should do so when the best way to assess adequately the combined impacts of similar actions or reasonable alternatives to such actions is to treat them in a single impact statement. (3) Mitigation measures (not in the proposed action). The NEPA directs federal agencies to “study, develop, and describe appropriate alternatives to recommended courses of action in any proposal that involves unresolved conflicts concerning alternative uses of available resources…” (NEPA Sec. 102(2)(E)). The range of alternatives explores ways to meet the purpose and need for the action. The purpose and need statement helps define the range of alternatives. The broader the purpose and need statement, the broader the range of alternatives that must be analyzed. Analysis of alternatives is limited to alternatives that permit the FWS to make a reasoned choice (40 CFR 1502.14). For some proposals there may exist a very large or even an infinite number of possible reasonable alternatives. When there are potentially a very large number of alternatives, the FWS must analyze only a reasonable number to cover the full spectrum of alternatives (CEQ - Forty Most Asked Questions Concerning CEQ's NEPA Regulations - 1b). When working with cooperating agencies, the range of alternatives may need to reflect the decision space and authority of other agencies, if decisions are being made by more than one agency. An EIS should describe the purpose and need for the proposed action, and discuss all environmental impacts of the proposed federal action, alternatives to the proposed action, and mitigation measures (see 40 CFR 1502.12 and 40 CFR 1502.3). After the FWS conducts the scoping analysis it will prepare a Draft Environmental Impact Statement (DEIS). The CEQ regulations require NEPA documents to be “concise, clear, and to the point” (40 CFR 1500.2(b); 40 CFR 1502.4). Analyses must “focus on significant environmental issues and alternatives” and be useful to the decision-maker and the public (40 CFR 1500.1). Discussions of impacts are to be proportionate to their significance (40 CFR 1502.2(b)). Similarly, the description of the affected environment is to be no longer than is necessary to understand the effects of the alternatives (40 CFR 1502.15). "Most important, NEPA documents must concentrate on the issues that are truly significant to the action in question, rather than amassing needless detail" (40 CFR 1500.1). Accept a proposal regarding an action to be taken. Identify the purpose and need for action and and describe the proposed action to the extent known. Develop a scoping strategy and conduct scoping. Develop reasonable alternatives to the proposed action. Identify, gather and synthesize data. Analyze and disclose the impacts of each alternative. Identify potential mitigation measures to reduce adverse impacts. Once the DEIS is complete, the FWS reviews it for adequacy and ensures that it complies with both DOI and CEQ NEPA regulations. 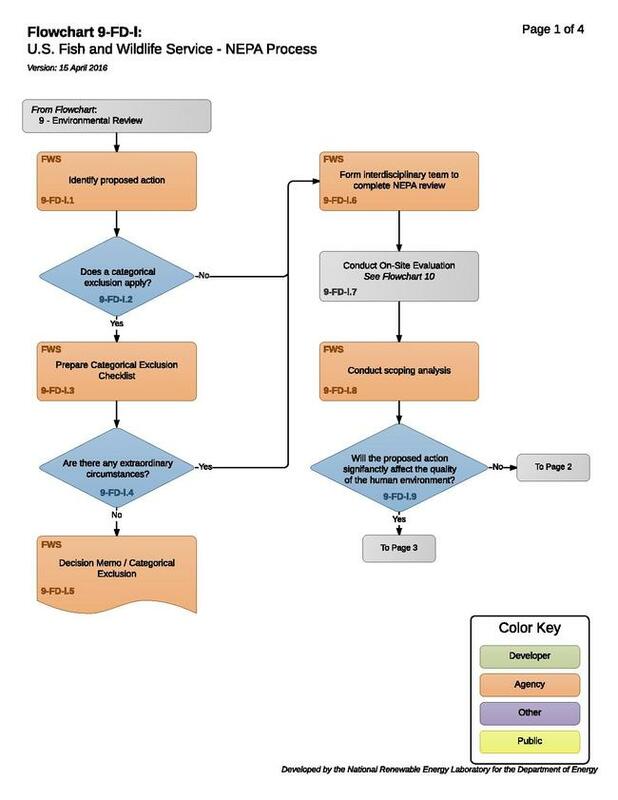 Timelines for the review can vary widely between field offices, and the required review process heavily influences the schedule, scope, and budget for the EIS. See FWS NEPA Handbook at 29. The FWS publishes public notification of the availability of the DEIS, which includes publication of a Notice of Availability (NOA) in the Federal Register for actions with effects of national concern (40 CFR 1506.6(b)). The FWS also files DEIS with the EPA in accordance with DOI procedures. The EPA then publishes notice of the filing in the Federal Register. The date the EPA notice appears in the Federal Register initiates the public review period. The minimum review period is 45 days starting from when EPA publishes the NOA in the Federal Register. There are no content or format requirements for an NOA other than those associated with the preparation of notices for publication in the Federal Register. In addition to announcing the availability of a document and the public review period, where applicable, the NOA will generally identify the purpose and need of the action, describe the proposed action and alternatives, and indicate the dates and location of public meetings on the document. Consult program-specific guidance for any other content requirements. See FWS NEPA Handbook at 31. After the FWS completes the process for preparing a DEIS and files the DEIS with the EPA, the review period for the DEIS begins. The minimum review period for a DEIS is 45 days from the date the Notice of Availability is published in the Federal Register containing notice of the DEIS (40 CFR 1506.10). During this period, the FWS solicits public comment, and is required to consider and respond to every comment (40 CFR 1503.4). The FWS may choose to hold a public hearing if there is substantial controversy concerning the proposed action, substantial interest in holding the hearing, or an agency with jurisdiction over the action requests a hearing supported by reasons why a hearing will be helpful (40 CFR 1506.6(c)). At the conclusion of the EIS process, the FWS issues a final Environmental Impact Statement (FEIS). CEQ regulations set forth a preferred standard format for EISs found at 40 CFR 1502.10. FEISs will incorporate the contents of the DEIS, and consider and address comments where the FWS has determined required based on NEPA regulations (40 CFR 1503.4). The FWS will then complete another round of internal review and clearance. Once the FWS completes its internal review it will submit the FEIS to the EPA. Notice of completion of the EIS is published by the EPA in a “Notice of Availability of Weekly Receipt of Environmental Impact Statements” in the Federal Register. This begins the 30-day no action period in which the FWS must wait to issue a Record of Decision (ROD) (40 CFR 1506.10(b)(2)). After the 30-day no action period, the FWS will issue a Record of Decision (ROD) (40 CFR 1506.10(b)(2)). ROD’s are concise public records of the FWS’s final decisions (40 CFR 1505.2 and 43 CFR 46.110). When the FWS issues a ROD it describes the decision and the alternatives considered, the preferred alternative, factors considered, practicable means of avoiding environmental harm and whether the decision adopted the mean, and any monitoring and enforcement program established. In addition, the ROD summarizes public involvement in the NEPA process and how the FWS addressed public comments. 9-FD-l.35 – Does the Developer Decide to Appeal the Decision? The developer may decide to file an appeal if the developer believes the FWS’s final decision is adverse or incorrect (43 CFR 4.700). A decision by FWS, subject to appeal, is not effective during the period of time in which the person may file an appeal (43 CFR 4.21(a)(1)). The Department of Interior Board of Land Appeals decides finally for the Department appeals to the head of the Department from decisions rendered by Departmental officials relating to the use and disposition of public lands and their resources, including land selections arising under the Alaska Native Claims Settlement Act (43 CFR 4.1). If a stay is granted, BLM will notify the developer that a stay has been granted and will remain in effect until lifted (43 CFR 4.21(a)-(b)). Within 15 days after each document is filed, each adverse party named in the decision and the Regional Solicitor or Field Solicitor having jurisdiction over the state in which the appeal arose must be served with a copy of: NOA, Statement of Reasons (SOR), and any other documents. Proof of service is required (43 CFR 4.413). Within 30 Days after filing the NOA, the developer must file a complete SOR describing the reason for the appealing. If the SOR is included with the original filing of the NOA, an additional statement is not necessary (43 CFR 4.412). Within 15 days adverse parties named in the decision must be served with copies of the additional documents filed with IBLA. Proof of service is required (43 CFR 4.413). IBLA will review and render a decision on the merits of the case (43 CFR 4.403). If the FWS’s final decision is not appealed or if the FWS’s decision is upheld on appeal, the FWS and developer should implement and monitor the final decision as provided in the ROD. This page was last modified on 26 June 2018, at 08:04.